Waimes, station building anno 2001 on a rainy day in winter. 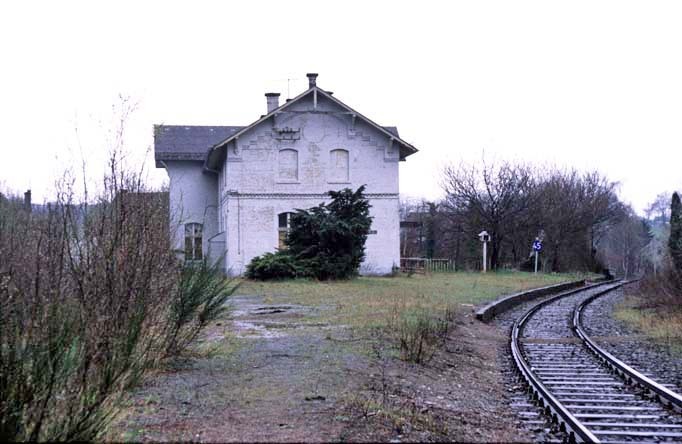 Waimes is a former junction station on the 'Vennbahn' in the eastern region of Belgium. In better times the station used to be a junction station on the former main line from Aachen running south via St. Vith to Luxembourg and to Trier. This line north-south was called the 'Vennbahn' to the region it was running through, a high situated flat and swampy fen area. There were several branches, one of these was running from Waimes to Malmedy connecting over the former German/Belgium border to Trois Ponts on the main line north-south (L42) in Belgium. A little bit more north in Weywertz another branch connected from Jünkerath via Losheim. This region has changed nationality several times over the last centuries. 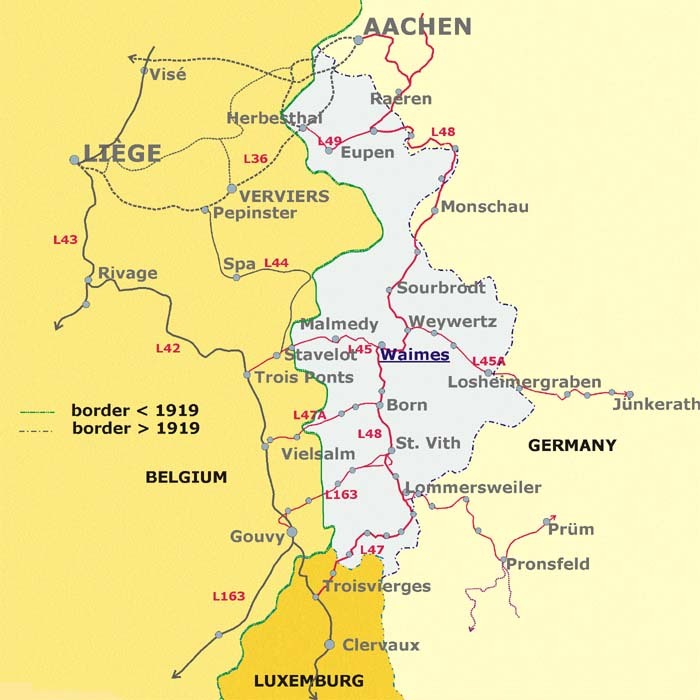 After the WWI the region became again part of Belgium with a special treaty to enable the operation of the railway line. Parts of the line were actually lying in Germany but the strip of land with the railway was Belgium territory. Under Belgian regime the line north-south became line 48 and the two branches were combined into line 45 running west-east to the new Belgium/German border line at Losheimergraben. In Waimes lines 48 and 45 combined over several kilometers through the valley of the Warchenne steeply going uphill over the watershed to the next station Weywertz where the lines split again. The Vennbahn was built from 1883 onwards by the Prussian state railways. 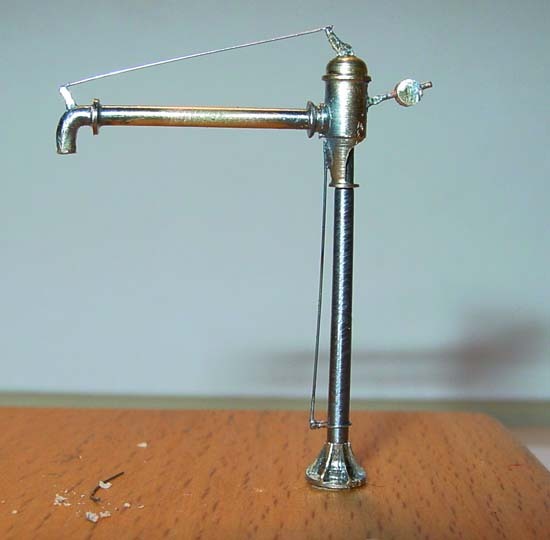 This origin is the reason of the mechanical signals being on the wrong side of track to Belgian standards and the use of German signals although with a Belgian sauce over it. The line developed well due to profitable prices of coal from the region around Aachen a century ago. The line was seeing heavy transports of coal southbound to industry south of Luxembourg city and north bound traffic of ore and industry goods to Germany. Therefore the line was doubled over its entire length and served as double track main line until around 1926 when the traffic due to the war damage compensation (mainly coal) to Luxembourg ceased to exist. With the effects of WW1 still vivid the Belgian goverment ordered the line to be brought back to single track as prevention measure on the brink of WWII. During the Ardennes offensive in 1944 all bridges and viaducts south of Waimes were demolished and the line did not survive this. Traffic was partly restored but the decline had already set in, withdrawing passenger traffic started in 1952 on some of the antennes south of Waimes. Around 1960 all passenger traffic was withdrawn on the entire line. Freight traffic gradually declined from serving on daily base to once a week until nill. In 1987 the line south of Waimes was finally broken up. The only reason for survival for the northern part, just as single track over the original trackbed, was due to military use as there is an army settlement in Sourbrodt. In 2006 the line saw a further step downwards due to the installment of maximum 10 km/h zone over a particularly bad piece of rail connections in the former yard of Waimes. The line was broken up in 2009 and transformed to a RAVel biking path. Surprisingly the station building in Waimes is still there after two decades of non-use and recently was even completely refurbished for private use. 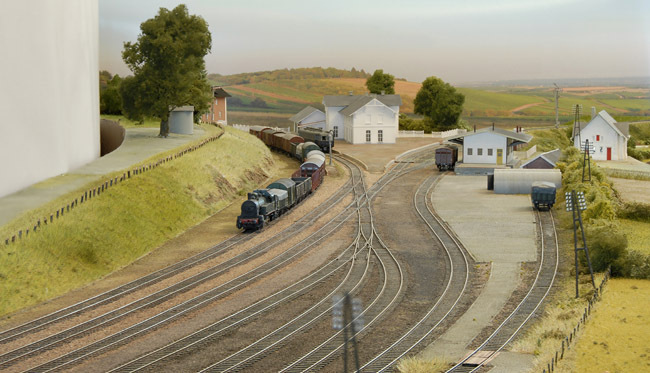 Junction stations always make up for a nice layout and this one is in my view particularly suited for a layout for use within Fremo. 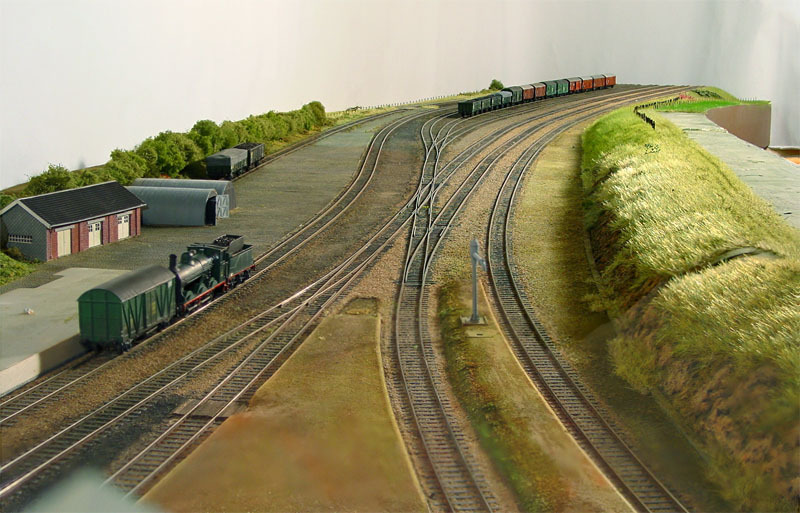 It is not the smallest of stations but certainly of a realistic size between small and middle. The nice features are the rolling landscape of cutouts and fill-ins, the background on most spots being higher than the foreground. The curve of near 90 degrees for the main line enabling through traffic with a high show factor. Also a nice station building situated in the junction of the arms, enough trees as feature and happily not too much other buildings in near vincinity. The layout is based on a drawing from the NMBS last revised in 1939, thus as single line in the situation that existed until 1952. 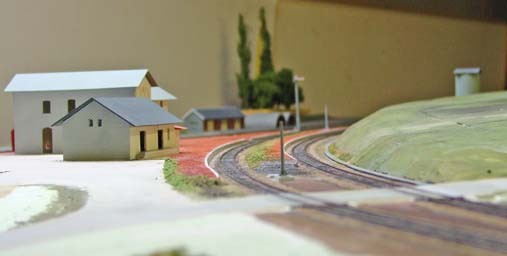 In that year there were several changes in the trackplan such as removing the triple point and turntable and repositioning some signals and relocating signal box 2 into the station building. 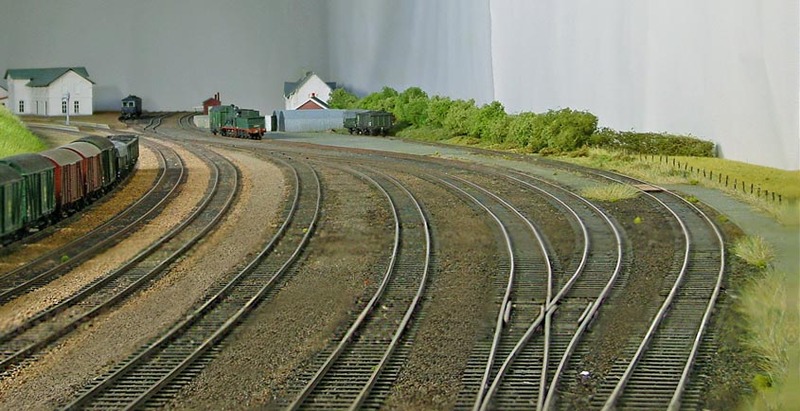 A view north upon double slip and triple point combination. These new photos below were produced with a Sony DSC-S85 compactcamera using the CombineZ5 software with a bit of tweaking in photoshop. same technique, The printed photographic background blends well with respect to the colours. Exercising the clamps!. Finally decided to construct the still failing modules, this is number 6 during construction, easter 2010. 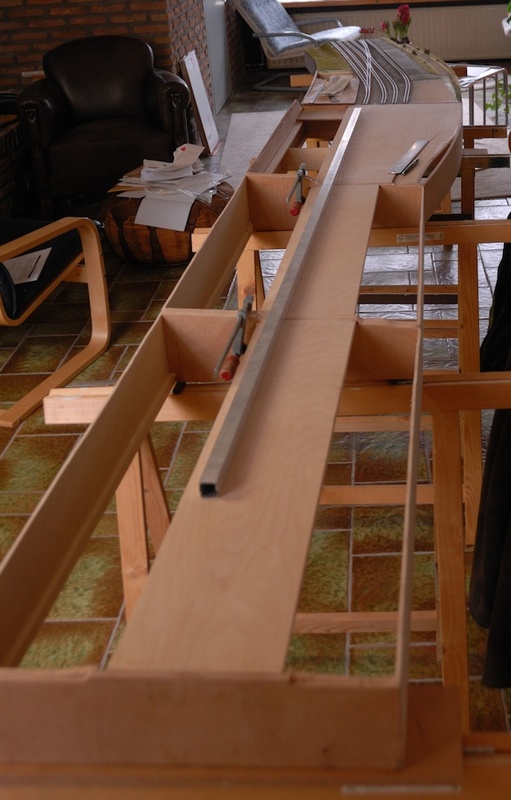 On wide areas with lots of track the base is constructed in U-form with 2 up-right strips to prevent bending. The edges only carry the landscape. An intermediate structural member was added later after the edges were in place. The baseplate is let into the headers by milling grooves. 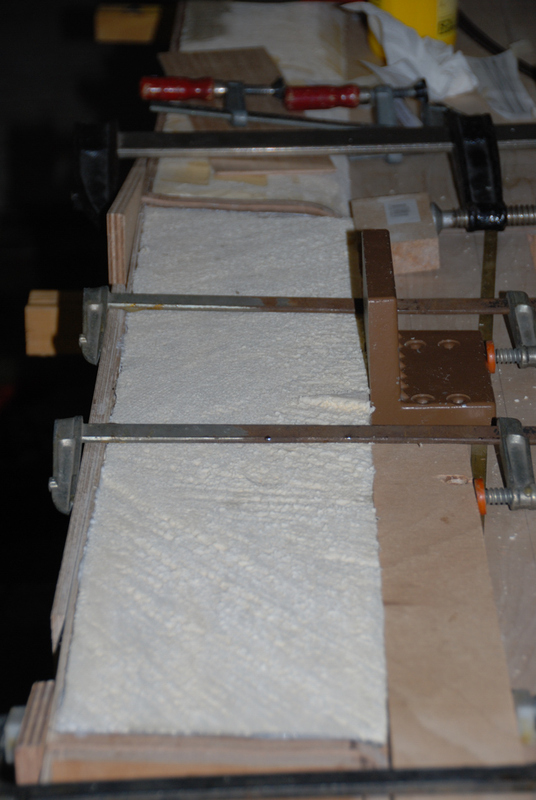 Also the edges sit in a milled groove in order to enlarge the gluing surface area. The headers are later shaped to the cross section of the landscape. An overview with the 3 last modules, roughly profiled. Here I am testing the fit and flatness using a straight aluminium profile. 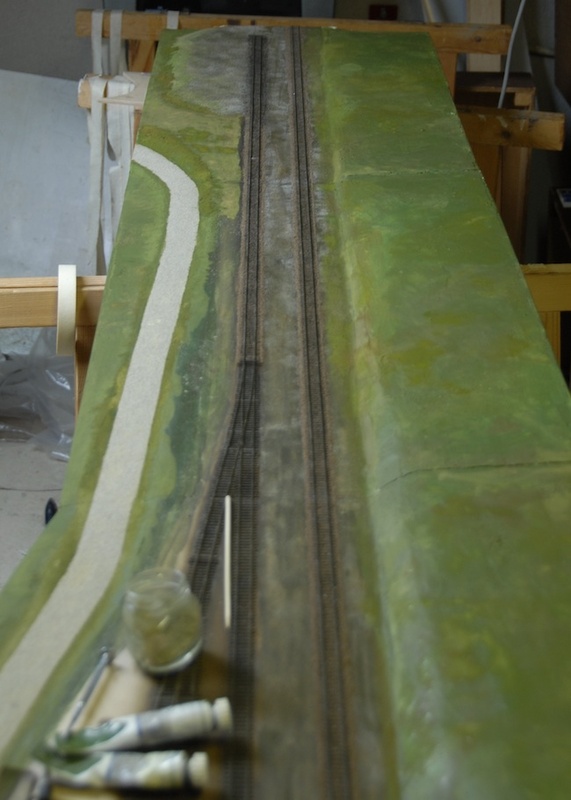 After this I set out all the track center lines and then took it apart and for shaping the landscape foam pieces. The open holes in the top at back are filled with a piece of 6 cm thick XPS foam that is already roughly shaped to the required form, a quick and dirty job using a large wood saw. 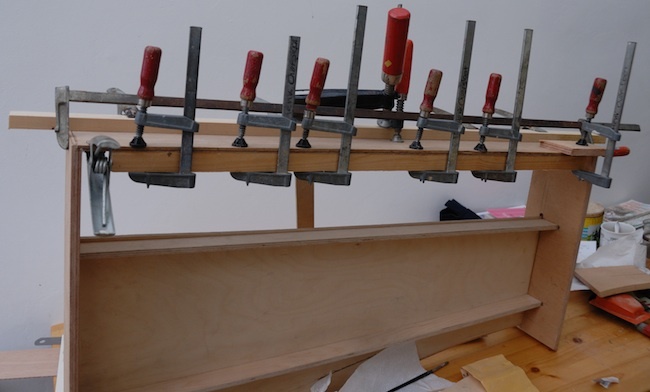 These are glued in using white glue, in this case using a series of clamps to keep it in place. After that the foam gets fine tuned using rasps and very coarse sandpaper (#40). 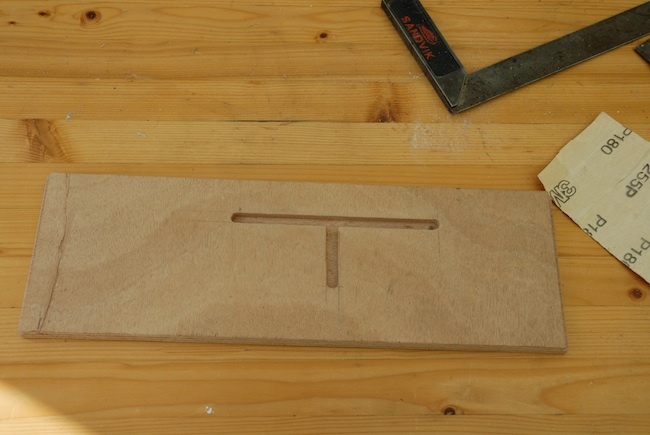 The boards are coupled up using bullet type pins and inserts for lining out and a set of M6 wing bolts and wing nuts. The three baseboards first get their exterior painting. Although not clear to see the first layer is an off-white filler to seal the wood. This saves paint later on. The reason to paint first is that your module looks quite a bit neater and more finished which helps to keep the incentive. But also spilling paint on your finished landscape has ruinous effects which are difficult to repair. Thus first finish all the rough work and then refine. 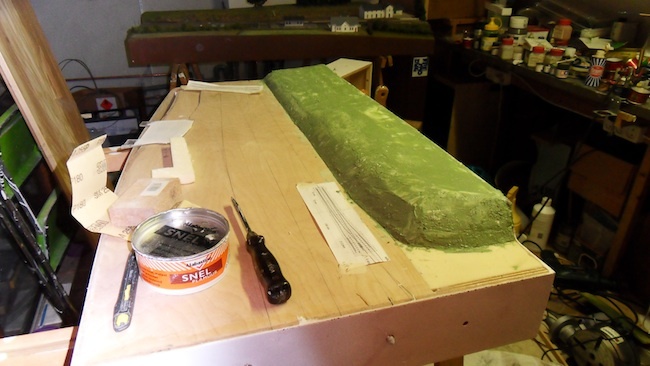 You can also see that the foam did receive a spread of slurry of model clay with green pigment. With the paint drying in the loft we can setup a board to built the last 3 points. Here we see them nearly finished. Cleaning up, gapping for insulation and removing from the board are the next phase. Then the laying of track can commence. Skipping a month due to the to Rheine meeting, no photo with the temporary track located yet. But this module saw its first active service in Rheine as double track entrance to the rest of the station. 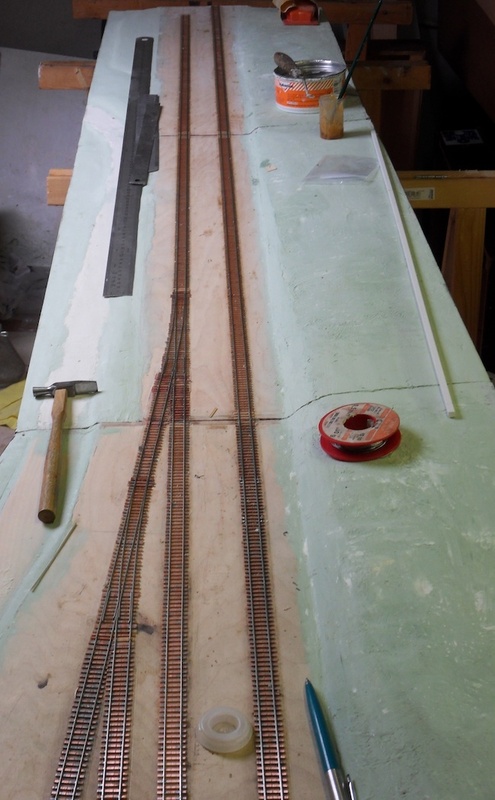 Some 2.5m track was produced and connected until I ran out of out of sleepers and rail. 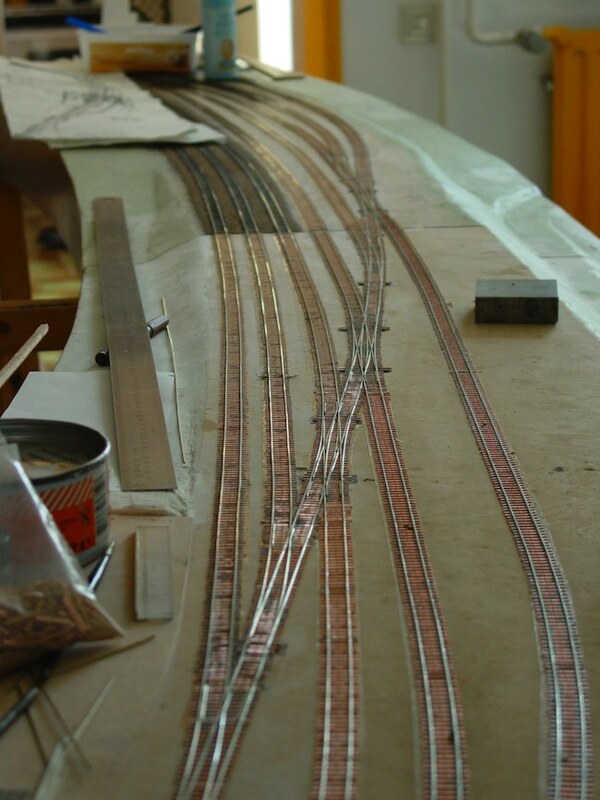 Progress in completing track was delayed, but other jobs enough to keep up progress. While waiting for the new track components some maintenance was carried out to this module prior to fixing the turntable. The turntable was then placed in its permanent position, fixed with screws. After that the earthworks around it were carried out to the install a flat base for the track. 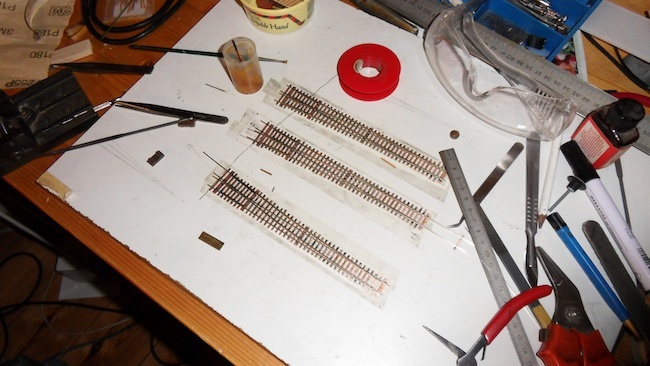 The photo shows it after the connecting track was layed after the arrival of the new components from shop 1. In the same period I could attend to the front area of the remaining modules. 12 mm PU foam came to good use to fill in the undeep area. 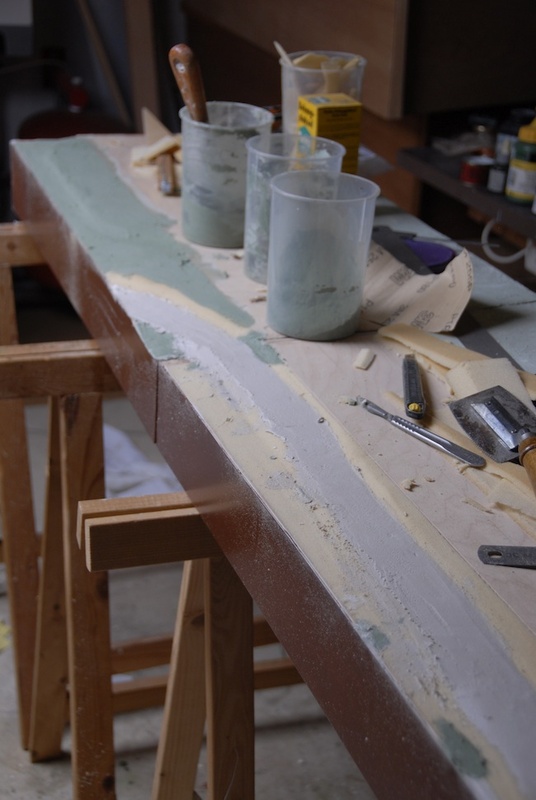 Here we see the road continued and the foam sealed with a layer of modelling clay. Also work was started on producing wire tree skeletons. A job perfectly suited while enjoying the summer in the garden. Another view this time after completion of the basic track. It still has to be cleaned, connected and painted but the rough work is out of the way now. 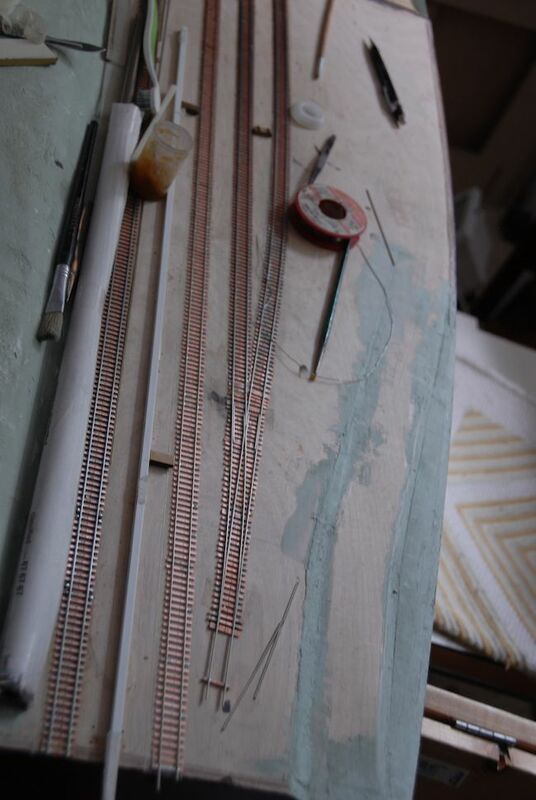 After this we can start the nice things with colors and materials converting the lot into a model of a railway. While everybody was watching football I have been beavering away with ballast and acrylic paints. 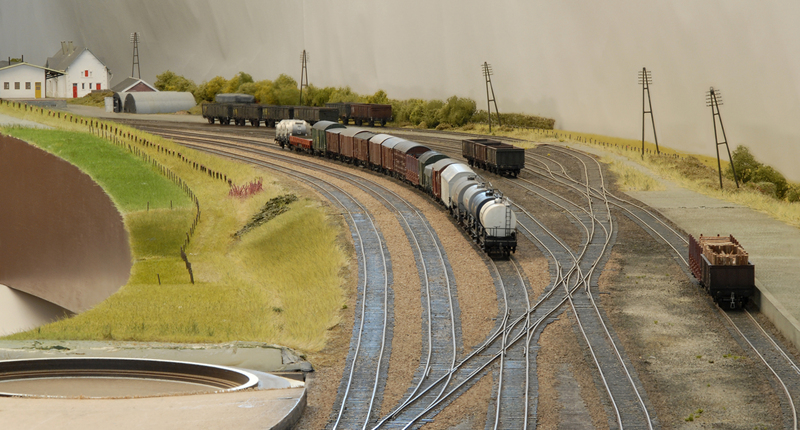 With the ballast drying you can play around with the brushes to get the base colours on the landscape. The rough work is done now, thus from now on progress will slow down. The follow up will be electrostatic grass and ground foam, both need care in application of colours which can only be done in full daylight. Lots of small trees are needed on the embankments but for this we have to wait for summer. Let's hope that this year it will be a bit longer than a single weekend. 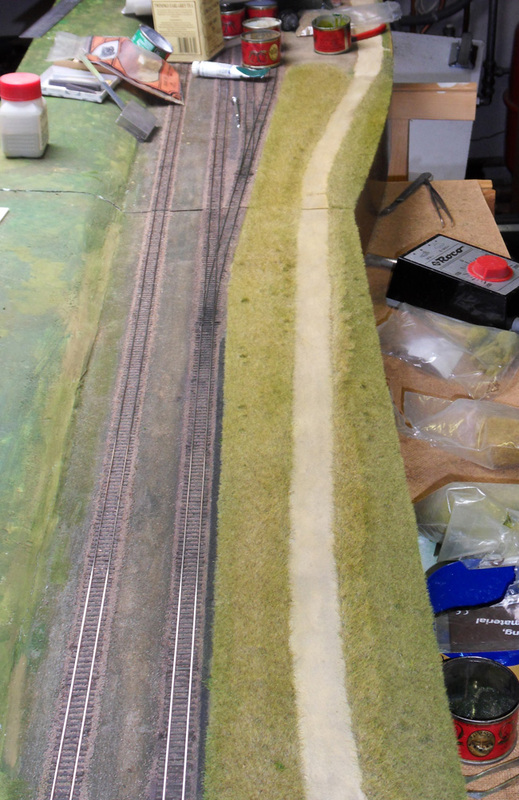 Here we see the track partly weathered and the edge along the front exhibits fast growing grass. More on how to apply this can be found in an additional page dedicated to this subject. It is a careful blend of selected fibers finished with an airbrush for the overal look. Weathering the ballast is mainly done by brushing powder pigments. 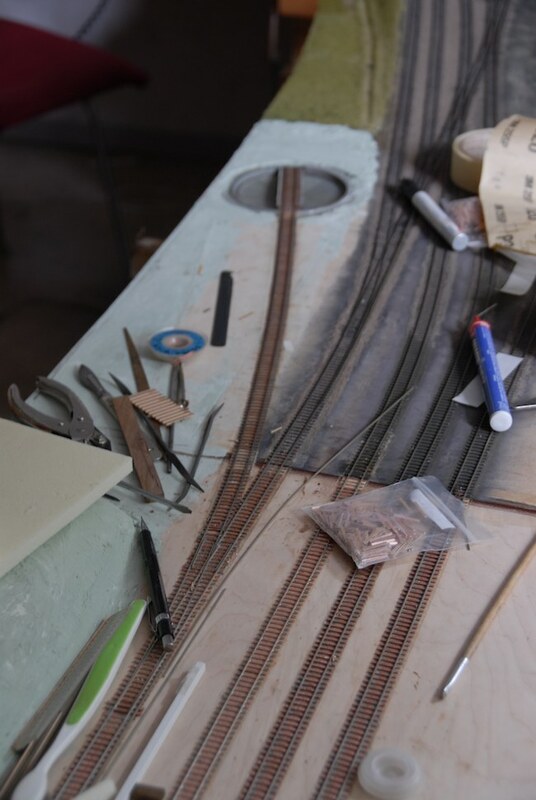 Small amounts of pigments can be made by grounding Conte de Paris chalks to dust and apply a mix of that over the trackbed by using a hard brush.